Yet another painting of milkweed! I just love trying to capture that fluff. This one was also done on that yummy handmade paper, made by Indigo ArtPapers. Many years ago while living in New Hampshire, I would see these beautiful plants on the side of the road. I discovered that these plants were milkweed. It wasn't the milkweed that I recognized though. That is because the milkweed was towards the end of its life cycle where the pods send their seeds off into the world. The colors of autumn were apparent in this unusual plant and I wanted to capture these colors and the fluffiness of the plant. I also discovered that the milkweed is where monarch butterflies lay their eggs. 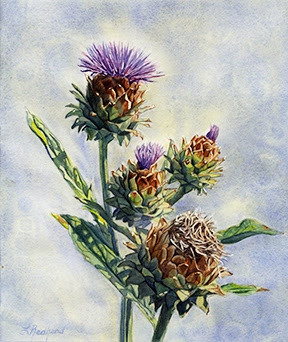 I painted a few images of this plant, which sold immediately. Apparently, other people like the beauty of the milkweed. 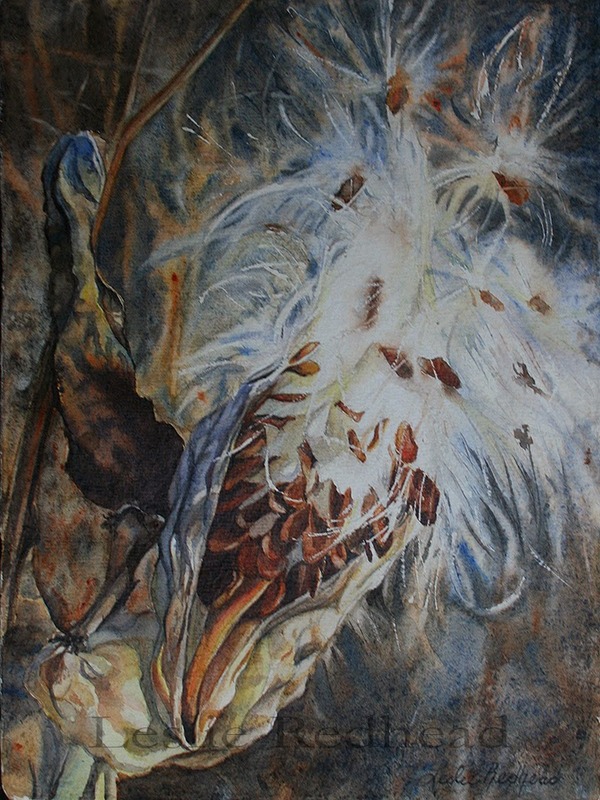 These past few weeks I decided to teach a Funky Florals in watercolor course and return to painting the milkweed. Butteryfly's Nest is one of the unusual and funky florals that I painted. It was also painted on Indigo ArtPapers. The creaminess and texture of the handmade paper was perfect for this image. A couple of months ago, I received a special preview on a new paper product from Indigo Artpapers. This preview really came at a perfect time for me. My favorite paper has always been Arches but I have recently noticed a change in their paper. The sizing seemed patchy and the paper didn't absorb the same way. It was very frustrating. At first, I thought I had a bad batch but each time I bought some more of the Arches paper, the same problems continued to happen! Then I heard that Arches was sold out to Canson. Somehow and someway, the paper has changed and I was not happy about it. So I have been trying out different types of paper to find the perfect one. 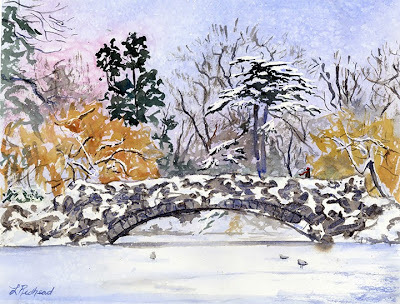 In this search for paper, I have considered switching from the mouldmade, such as Arches, to handmade paper. Then Indigo Artpapers, a manufacturer of handmade watercolor paper contacted me and requested that I give their paper a try. I was very happy to accommodate this request. I also investigated the company a bit more. Indigo Artpapers is located in Canada and distributes the handmade paper made in the family's mill in India. There are 2 types of paper. One is made from 100% high quality cotton rag and the other one is 75% cotton, 25% flax fiber. They are both archival and acid free. The most wonderful thing about the paper and the company is that they emphasize their environmentally friendly process. They are a "Green" company that doesn't use bleach like most paper companies use. 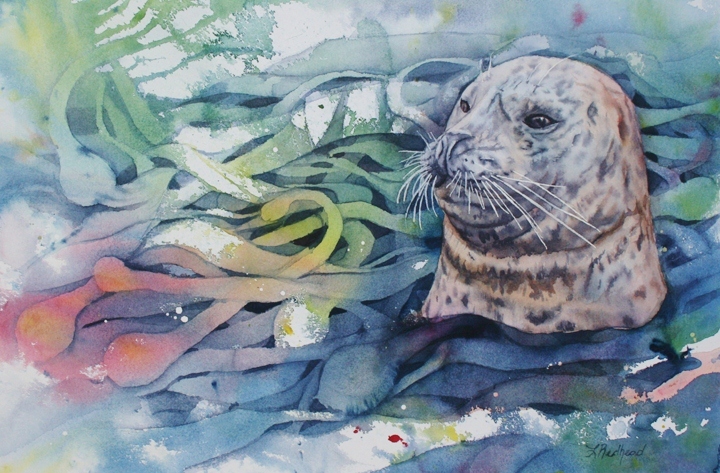 I like this because I often refer to myself as an "eco-artist" since watercolor is one of the most environmentally friendly of all the painting media out there. I was very interested in trying out this new paper. Since the paper does not use bleach, there is an off white color to it. At first this seemed intimidating but I quickly discovered what a nice warmth it gave to each of my pieces. (I have completed 4 paintings so far and starting on another one! The Life of Richard Parker is one of them) Besides, the slight ivory color becomes less noticeable as color is added to the paper. I also discovered how luxurious it feels to paint on handmade paper. 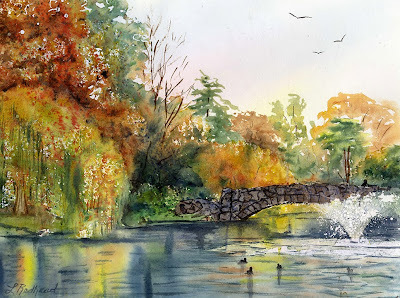 I know several watercolor artists that paint on handmade paper and they have told me that I will never go back. It felt like I was really treating myself to something special. A bubble bath instead of a shower. Hand-dipped chocolates instead of the Halloween leftovers. A real fire instead of the Shaw cable log. It was heavenly! 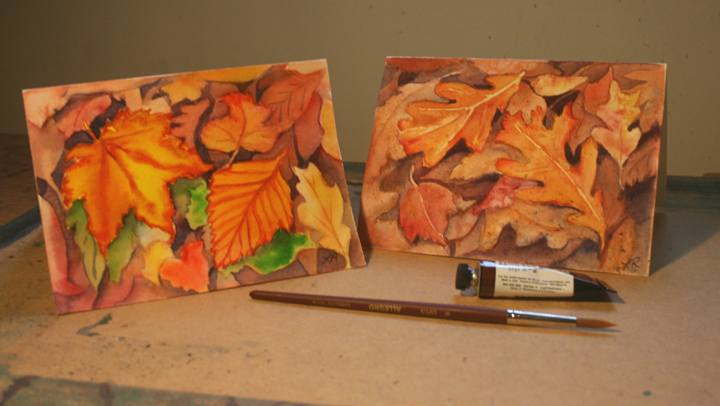 I have tried the 100% cotton paper and the cotton/flax blend and enjoy both of them. 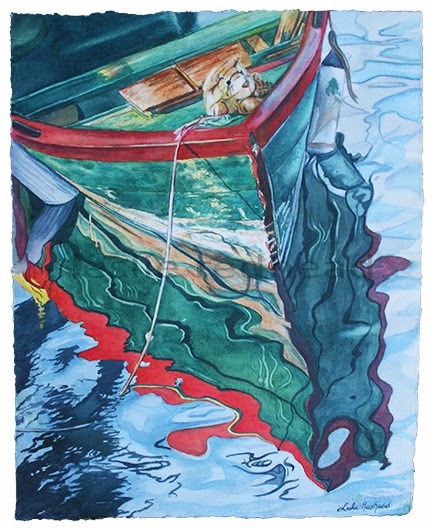 Although I will admit that 3 of the 4 paintings I've done are on the 100% cotton. Some habits just die hard. The paper does have some wonderful characters to it that adds appeal to the painting. This handmade paper is thicker and richer with its beautiful long fibers and I especially love the deckle edges! (Because of the deckle edges, please do not tape over them) It also feels like I am in collaboration with another artist by using this paper. An artist that took great care and pride in making this paper for me. One that values our world and the environment that we live in. An artist that has used their hands and their heart to create something special. Indigo Artpapers will be supplying their handmade paper to art stores in the near future. More information about the paper and their process can be found on their website by clicking here. In the meantime, I know what I want for Christmas: More Handmade Paper!! 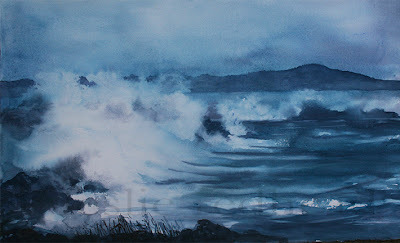 One of my favorite workshops to teach is Dynamic Waves and Water. This is because we get to really splash around and make some waves! Winter Blues is a painting I did last week to show the class. 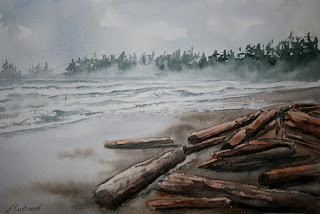 It was inspired by the photos I took during a winter storm at Oak Bay Marina in Victoria. 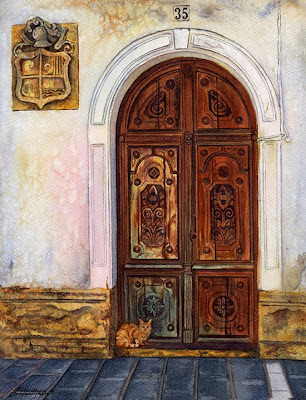 I did a series of door paintings this past spring for some of my classes. It was such a big hit that I was asked to teach how to paint more doors. Yeah! I love doors. But I must admit, the doors were not a hit with everyone. 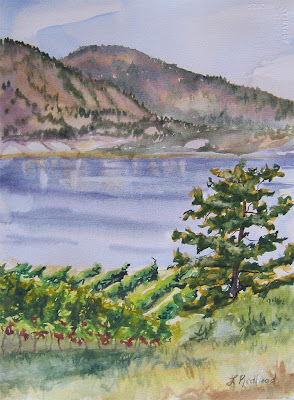 I entered two of my door paintings in the Federation of Canadian Artist's Small, Smaller, and Smallest show. They were Locked In and Knock, Knock. Both of them were rejected. I'm a little sad. It has been a while since I have entered any FCA shows since I have been busy working on my thesis. I was hoping to get back into the swing of things. It also makes me a little hesitant about entering their big signature show which is due next week. Rejection is part of the game of being an artist but it is still scary and isn't any fun at all. First I did a pale wash of winsor yellow and alizarin across the door. While wet, I added french ultramarine blue and burnt sienna to the walls. Then I tossed on some salt. Let it dry. Scrape off salt. 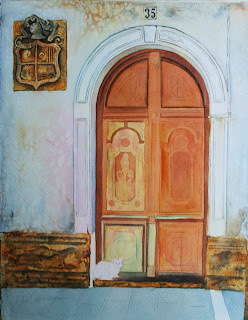 Next I used raw sienna, burnt sienna, and french ultra on the emblem and the lower walls, adding salt to create texture. 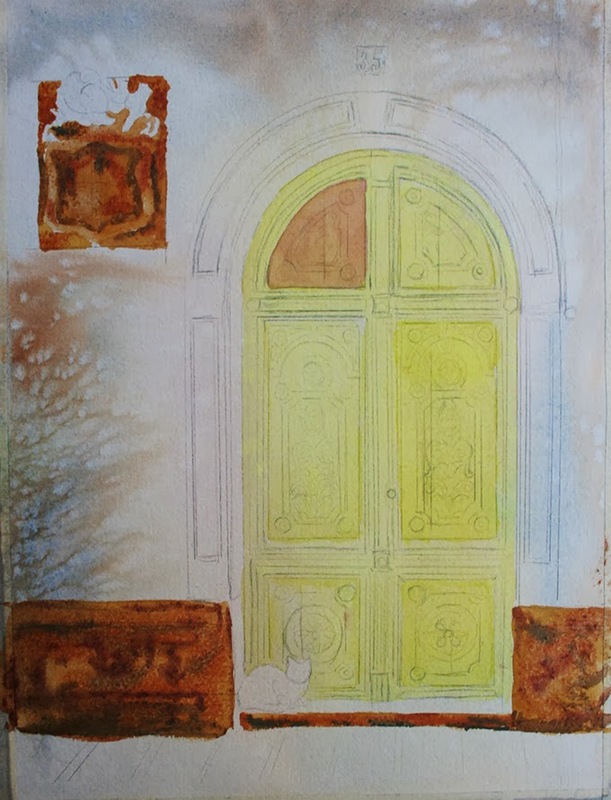 Winsor yellow was done as an even wash panel by panel on the door. After the yellow dried, I glazed permanent rose panel by panel on top of the yellow. I added detail to the emblem and the lower wall with ultramarine/burnt sienna mix. Then I started to glaze a mix of burnt sienna and perm. rose to the doors. This mix I used to build up dark in some areas and not so much with the panel on the left. Ultramarine was added to this mix to make it darker and then I did the shadows and the detail work with that. The sidewalk was done with a mix of ultramarine and burnt sienna. 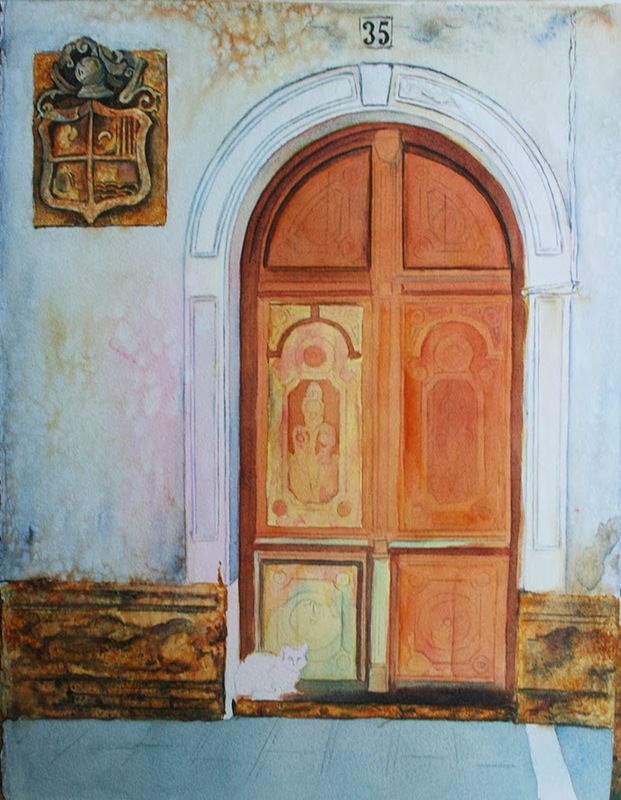 The cat is raw sienna, then burnt sienna, and finally the dark mix of ultra/burnt sienna. Whew! Think I got most of it. Later this month the Canadian Society of Painters in Water Colour (CSPWC) present their regional show, titled Western Streams. 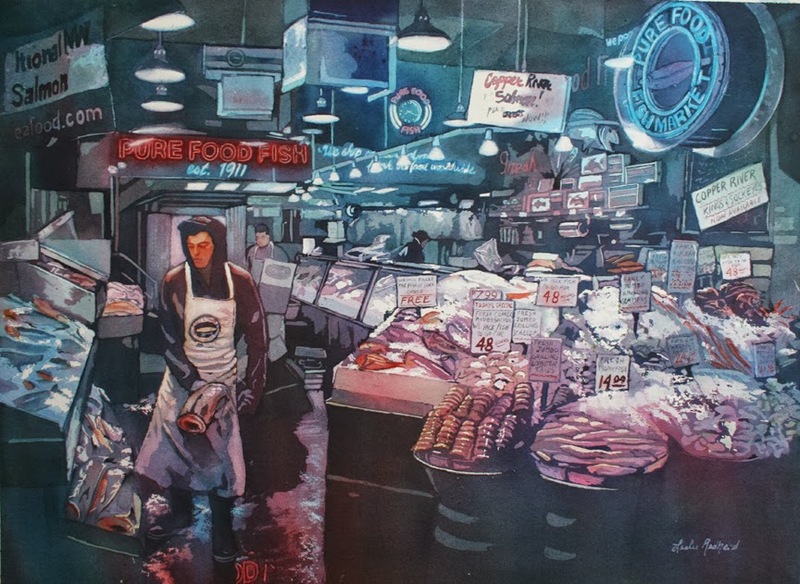 My paintings, Fish Food and Summer Tea have both been accepted into this show. 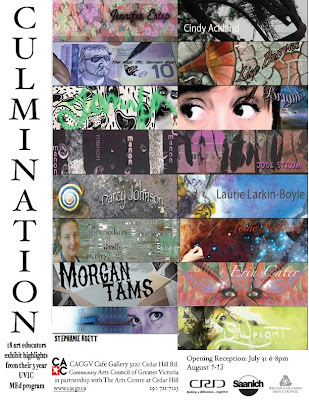 The exhibit is at Leigh Square in Port Coquitlam, BC. The exhibit opens Oct 24 and runs until Nov 25. Three of my paintings are on the back of the invite! But that is because I am teaching a workshop for the CSPWC. 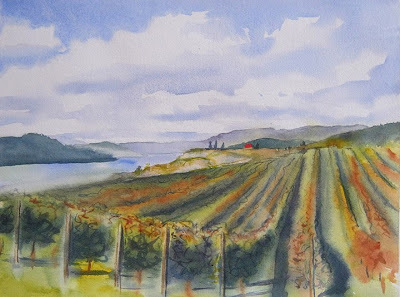 The workshop is on poured watercolors, which is something I only teach by special request. It doesn't happen often, so if you want to learn, it is best to try to get in on this workshop. 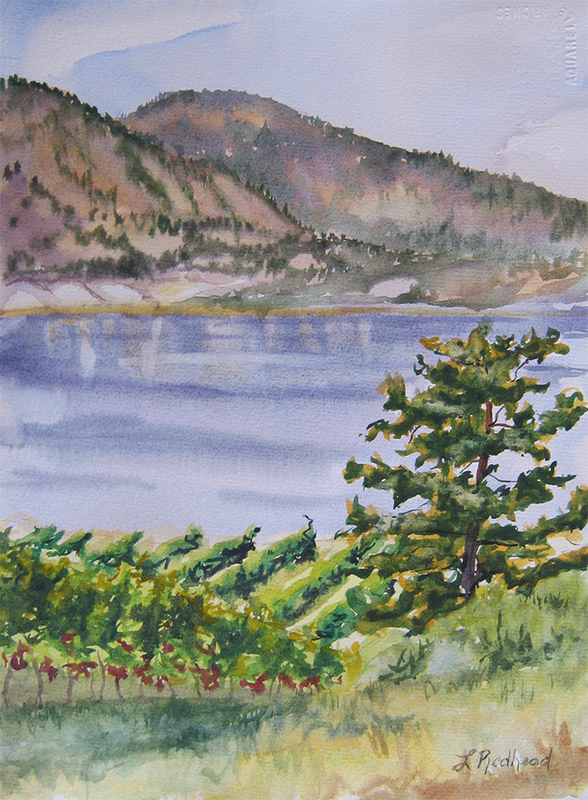 This past weekend I had another wonderful opportunity to teach a workshop. This time it was on windowboxes. This workshop came about because a woman from Australia that was visiting Vancouver Island found my blog and asked if I was teaching. I wasn't planning on it but decided to "put it out there" and see if anyone else was interested. And they were! So thank you to Bev for requesting the workshop and a big thanks to Dana for requesting the subject of a windowbox. I had a great time teaching so many talented people. 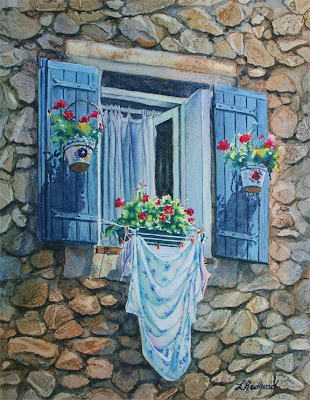 This windowbox with the lovely laundry hanging from it is from France. Don't you just love it? I did and that's why I had to paint it. My Opus Art Supply video is out! Yeah! I was really nervous about it but I shouldn't have been. Ryan Mund made me sound very professional and did some great shots of the painting. He is the real mastermind behind it. Thanks Opus and Ryan for giving me such a wonderful opportunity to talk about what I love! 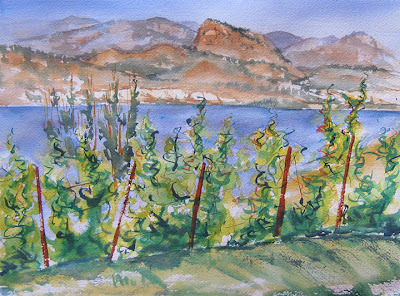 This painting is from a class I taught a few weeks ago on West Coast Scenes. The image is from a series of photos I took while in Brentwood Bay, BC. 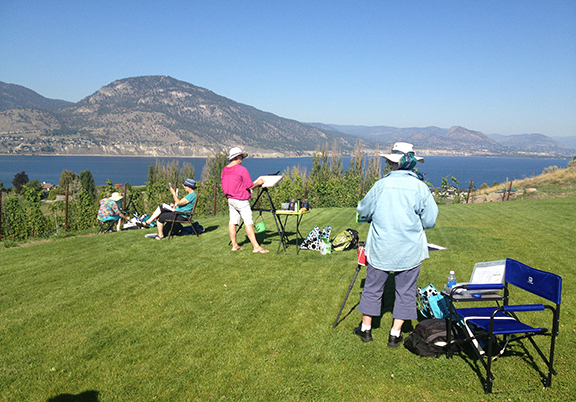 Last week I spent an amazing 4 days teaching a plein air course in the vineyards of Penticton and Naramata, BC. 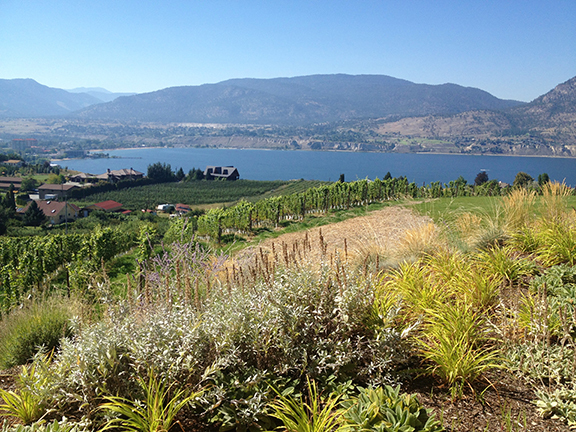 These vineyards overlook Okanagan Lake and have these incredible views. And I must say that the weather was perfect. Hot, sunny, and dry. There were 13 fabulous students from all over the province that participated in this painting and wine event. The first two days were spent at Poplar Grove Winery. 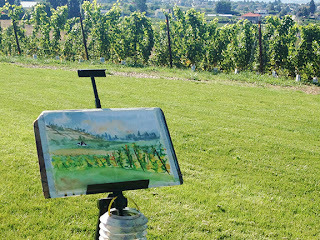 Poplar Grove was very gracious to let us paint the vineyards and they provided us with a space in their barrel room to paint still lifes in the afternoon. 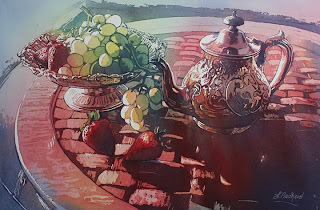 Sam Boehner taught the still life portion with all things wine. We then spent the next 2 days at Bench 1775 Winery down the road. 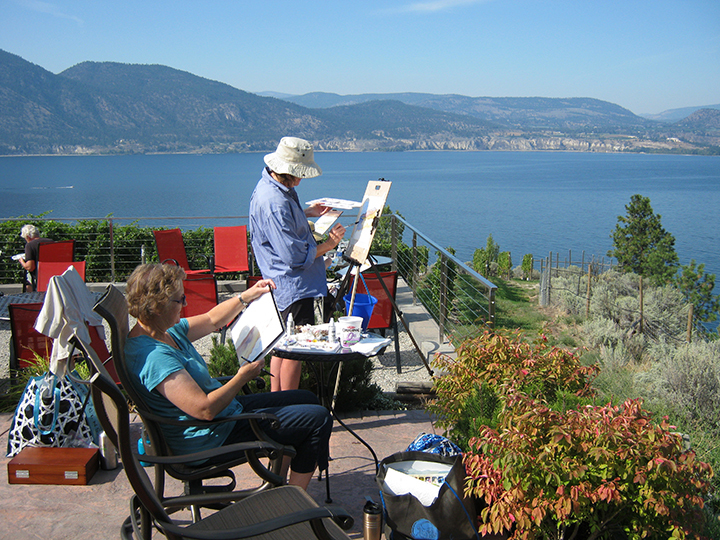 The views there were fabulous to paint. Bench 1775 was really hopping on the first day as we tried to stay focused on the painting and not the wine. But the wine may have won out later in the day. We ended up going out to some great places to eat and drink for dinner after a swim in the lake. There are plans to do another painting and wine event in the future since it was so much fun. The crowning jewel of my thesis project is my painting of the Lower Falls of Yellowstone National Park. If you watched my YouTube video, you probably saw it on there. But here it is again. As you can tell, it is 3.5 feet wide by 5 feet tall. 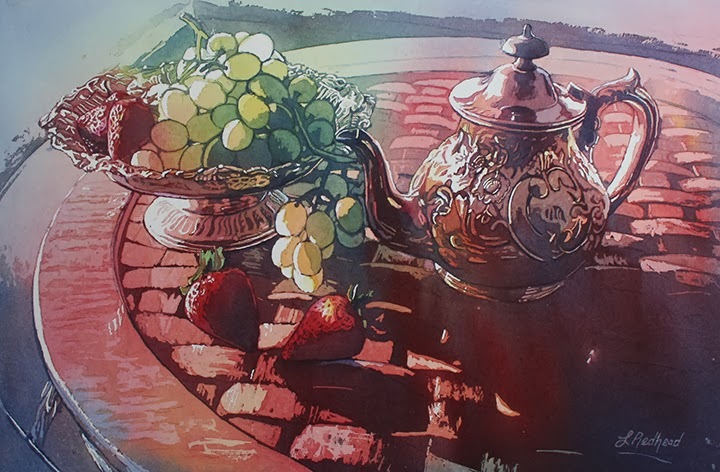 Now you may wonder how it is that I was able to paint on watercolor paper that large.Watercolor paper does come in large rolls that are 10 yds long. I wasn't about to attempt that! What I did was stretch the paper like a canvas onto stretcher bars. Then I painted. Sometimes with a really big brush (#30 round) and sometimes with a small one (my favorite #6). It took me probably a total of 30 days over 6 months to paint but I did it! And you know what, I loved every minute of it. Here I am with the completed painting. Since arriving home from school just over a week ago, I have been indulging in the domestic. Cleaned the house top to bottom and the washing machine has been running non-stop. Of course, in the middle of all that, I did the filming with Opus Art Supplies but really, I have been loving the fact that I have a couple of weeks off with no deadlines. It has been nice to spend time with the kids school shopping, baking cookies, and making homemade salsa. I have even taken several leisurely walks through the woods with the kids and the dog. I almost feel lazy not spending 14-16 hours/day in front of a computer trying to write a thesis. I can't believe that I have hardly even picked up a paint brush! As I often tell my students though and just like in painting, the spaces in between can be just as important as the time you put in. My kids and my walks are what fills me up and gets me ready for painting. I get to observe, reflect, and photograph. This morning I did sketch my son as he sat on the couch waiting for school to begin. He starts high school today (only grade 8 but the high schools here are grades 8-12). It is a moment of observing him that I will look back and cherish. I will be teaching a drawing course starting in a couple of weeks. Although I have taken many drawing courses and taught private drawing lessons, teaching drawing to a group will be a new challenge. I am trying to sketch something each day. I hope to capture my kids more often. But other than drawing my kids more, I have another goal for the coming year. It is fairly simple but I am going to try to take a photograph of my surroundings each and every day. Most of these will probably be of Pacific Spirit Park. 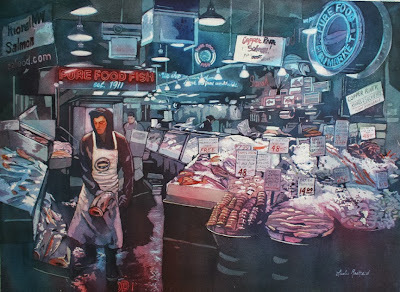 I already photograph a ton of images as painting references but not on a daily basis. The reason for my wanting to do this daily is that my family tends to move every 3-4 years, just as we start to feel really settled. We don't have any plans to move any time soon but I also realize that I will probably not live in Vancouver forever. I love it here and I want to capture what to me is the best part of Vancouver and all its moods before I am gone. Even if it is years before I leave. I wonder what I will notice about my surroundings by keeping a daily photo journal. I am interested to know if any of my readers keep a daily photo journal. Is there anything you have observed that you would not have otherwise by doing so? Yesterday, Opus Art Supplies filmmaker Ryan Mund, along with his assistant, Peter, came into my studio and filmed me painting. This filming will become a how-to video for Opus on their YouTube channel. 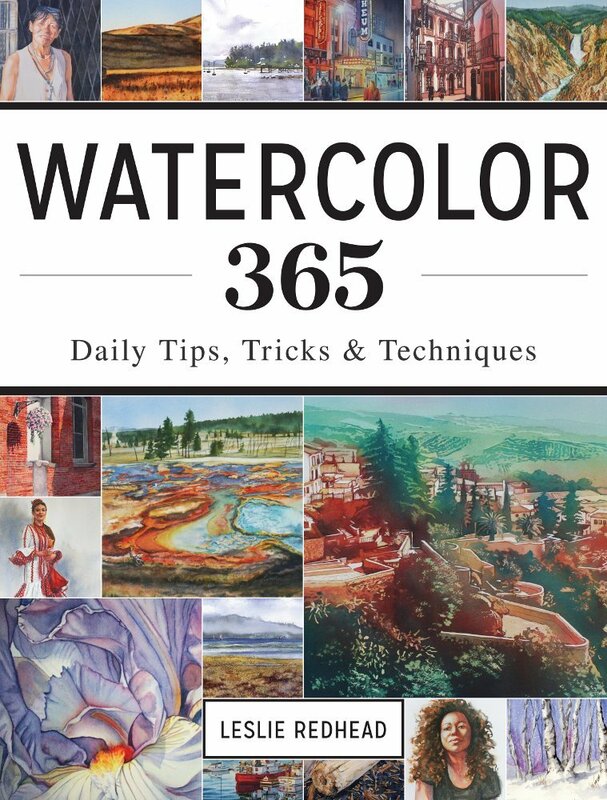 This video shows some simple watercolor tips and techniques for painting a greeting card on Strathmore watercolor cards. 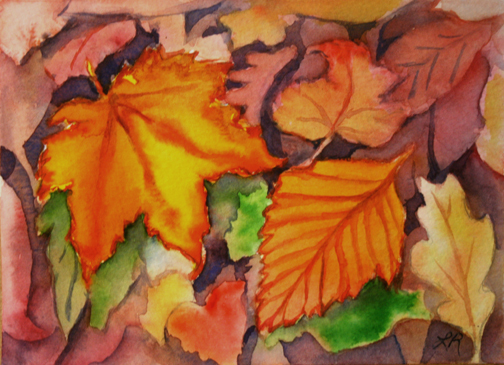 Since the video will be released later this month, I chose to paint autumn leaves using all those yummy fall colors that Daniel Smith and Winsor & Newton carry. It was a full day of filming and I was able to try some new products out. 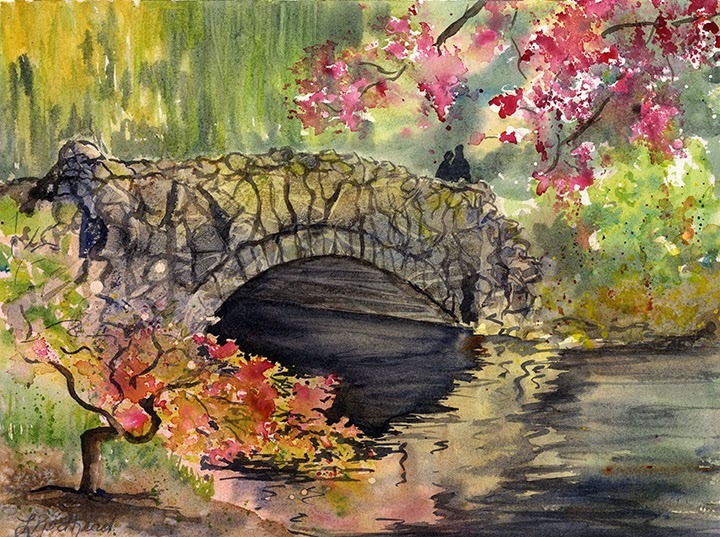 One of these products is Nicholson's Peerless Watercolors. The Peerless comes in bottles in liquid form and in dry form on sheets. The paint is extremely vibrant and colorful. 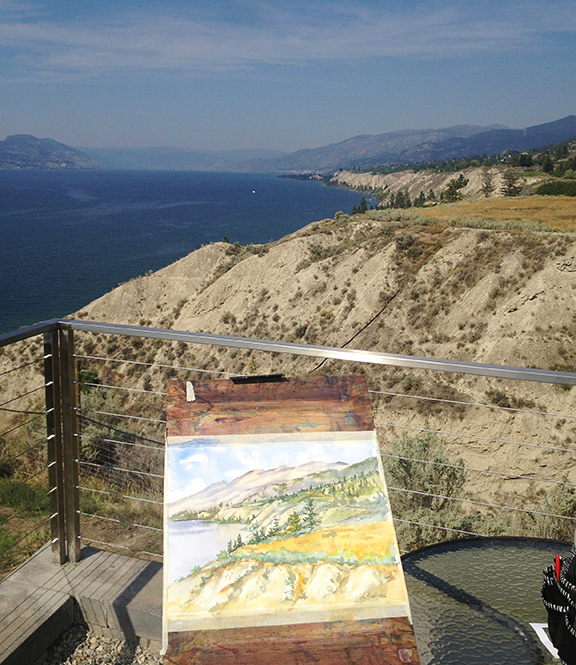 The sheets were fascinating and look like they will be great for doing plein air painting and to travel with. The color from the sheets seemed just as vibrant as the colors in the bottles. They are definitely worth more investigation. I can't wait to do some plein air painting with them! Ryan sitting in my chair and showing me how to Vanna White the art supplies used in the video. Ryan did a great job of making me feel comfortable and was very informed about watercolor. Peter showing off the cookies. Peter also did a fabulous job holding the boom mike. Thank you guys for such a great day! Of course I will let everyone know when the video is released. I did it!! I am now a Master!! Thank you to everyone for all your encouraging words and for helping me through this. It has been a long journey over 3 summers but I did it. 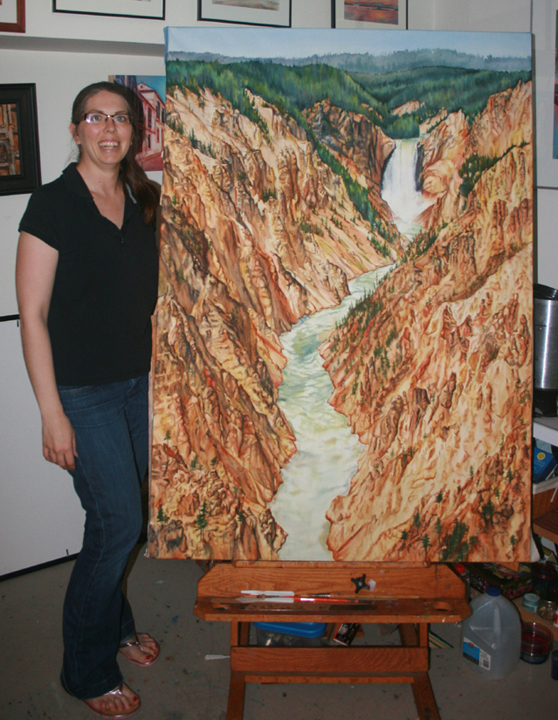 My thesis project ended up being on painting Yellowstone National Park. I journaled this process and ended up writing and designing a book about it. This book may become available for purchase. Here is the longer version of the video I put up a couple of weeks ago. This is the video I presented to my thesis committee yesterday. Learning how to create the video was part of my project. I am rounding the bend on completing my Master of Education in Art Education. I defend next week. Just a few more days. Yeah! 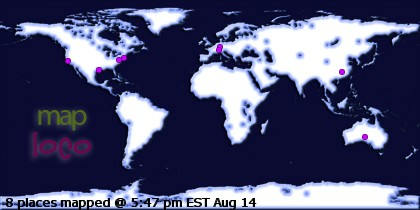 Now you may wonder why I have time to blog in all of this. Well, that's because I am working with large files and as I sit and wait for them to transfer between computers and to render, I thought what better way to spend my time than with all of you! And it helps me to stay awake while I wait. In my previous post, I showed the artist statement that I did as part of my program. It highlights the thesis project I have been working on. 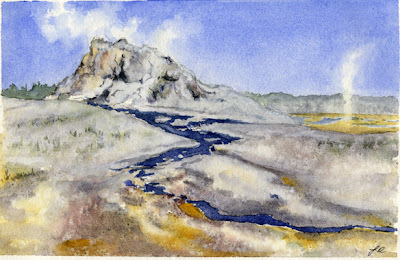 This project is the journaling of my process of painting Yellowstone National Park over the past year. Firehole River Springs is a part of this project. You may have seen it in my artist statement as well as me painting on location. My defense will consist of an expanded version of my artist statement, which will be 10 min long, along with a book that I wrote and designed about my process. 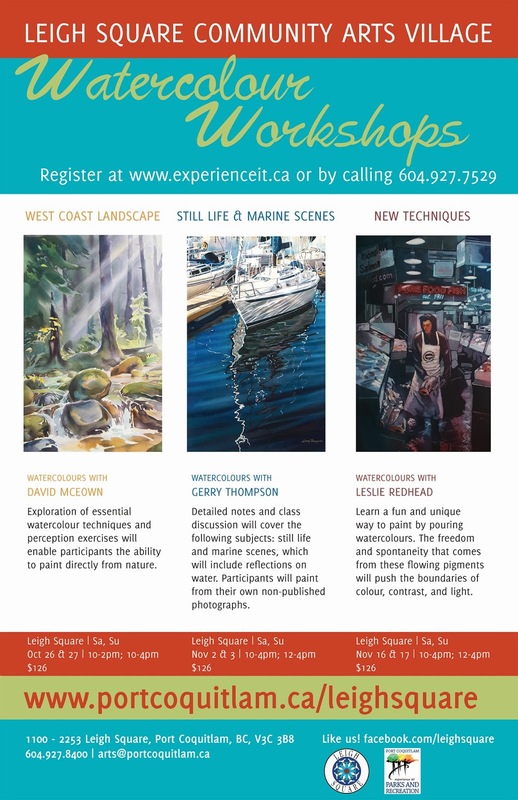 Since being in Victoria this summer, I have been asked by several students of mine if I will be teaching another workshop. The answer is YES! I will teach another workshop. So I am teaching a 2 day workshop on Aug 23-24 at a friend's studio. 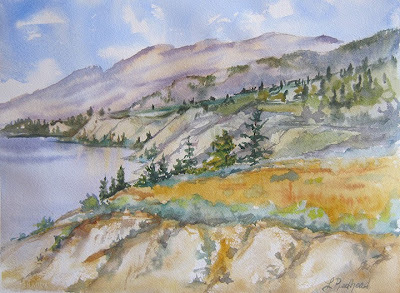 It will be on painting the West Coast Landscape in Watercolor. The scene will be different than the above but will include what makes our coast so unique. If you are not able to attend, I will be teaching another workshop on Oct 5-6 in the Victoria area. The subject is yet to be determined. Plans are still in the works but I am open to suggestions. Some of you may have seen this but I am finally getting around to posting it to my blog! For my digital presentation class this summer, I had to put an artist statement up on YouTube about my thesis project. So here it is! 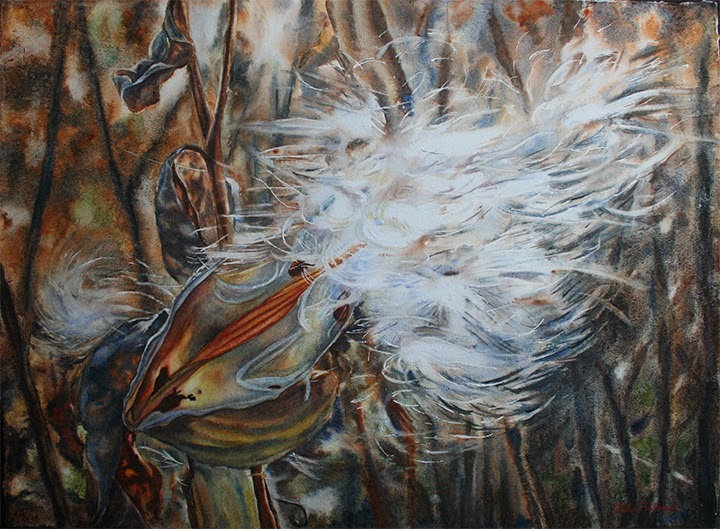 For the past 3 summers, while at the University of Victoria, I have worked in a studio with 18 other amazing artists. All of us are currently in the middle of completing our Masters of Art Education. To celebrate this event and to show some of the work we have accomplished while in the program, we will be exhibiting at the Cedar Hill Rec Centre in Victoria. I will have one piece in the show. The exhibition runs from August 1-13 in the Cafe Gallery. We will be having an opening reception on July 31, 6-8 pm. 3220 Cedar Hill Rd, Victoria. Hope some of you can make it there! Here is another painting from my series of Yellowstone National Park. I am currently working on the written portion of my thesis project which is a journal of my painting process of Yellowstone National Park. White Dome Geyser is just one of the small sketch like paintings that I did for the project. This weekend I am teaching a course called Old Growth Forests of Vancouver Island in Watercolor. The above piece is what we are painting. It is a scene from near Lake Mesachie which is south of Cowichan Lake. 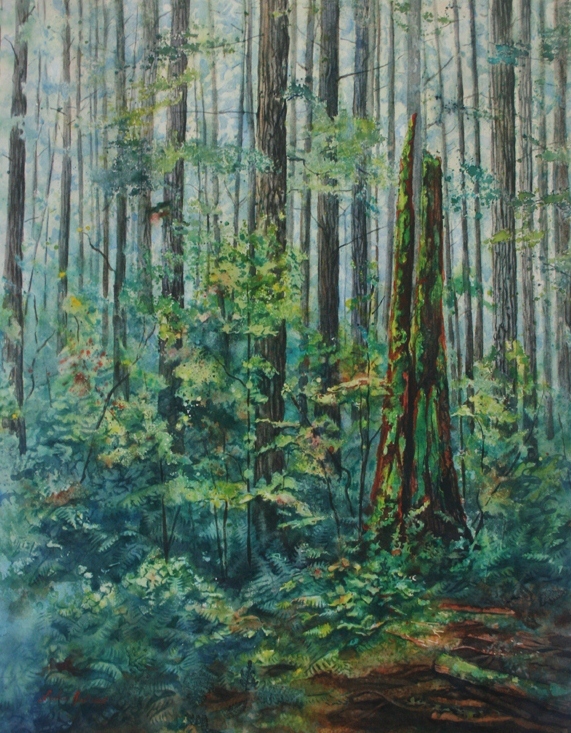 I called it Island Treasures because there are so many wonderful things to be found in the forests of the island. It is also a part of Canada's Mossiest Maple Rainforest. The rainforest is in the territory of the Hul'qumi'num First Nations group. 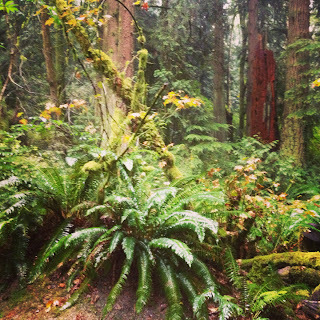 It is a forest of big leaf maple trees that are draped in gardens of mosses and ferns. 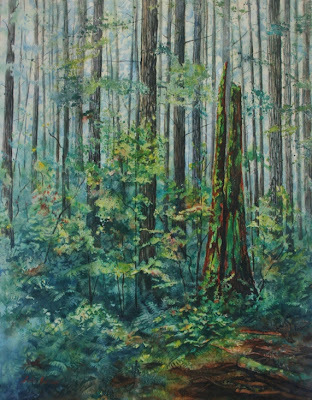 Other old growth forests in Canada are coniferous (firs, cedars, spruce, etc). This rainforest has mostly deciduous or broad leaf trees. The Rainforest is also nicknamed Fangorn Forest after the ancient forest in "Lord of the Rings"
Unfortunately, this forest is not protected. It would be good if this area received the recognition and protection that it deserves. More information and images can be here. 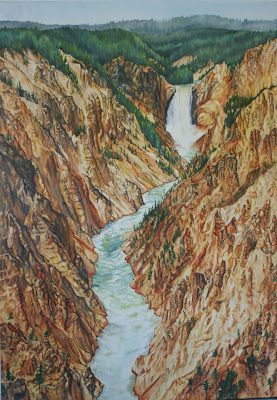 To celebrate the birth of my country, I decided to put up another Yellowstone painting. Yellowstone National Park was not only the first place in the US to be preserved and recognized as a national park, it is the first one in the world. Yellowstone was recognized by Congress in 1872 with the help of a watercolorist, Thomas Moran. Moran journeyed to the region just to capture the place in paint. These paintings were then presented to Congress to convince them that all the stories of the natural wonders were real. It obviously worked. For that is the power of art. 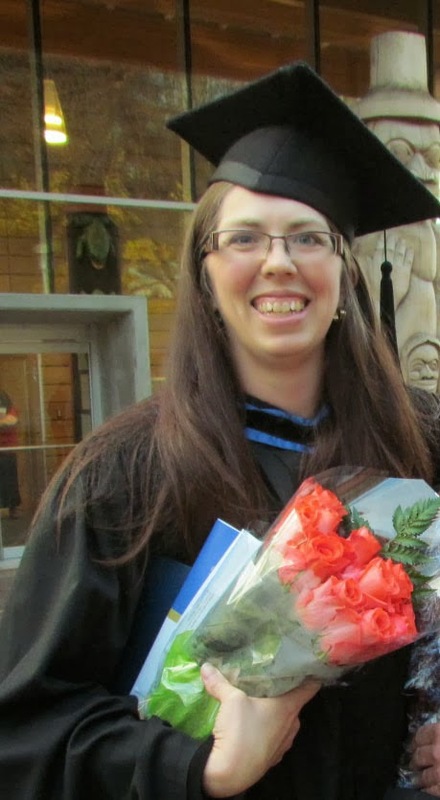 This summer is my last summer for working on my Masters of Art Education degree. At the end of last summer I finally figured out what I wanted to do for my thesis project. 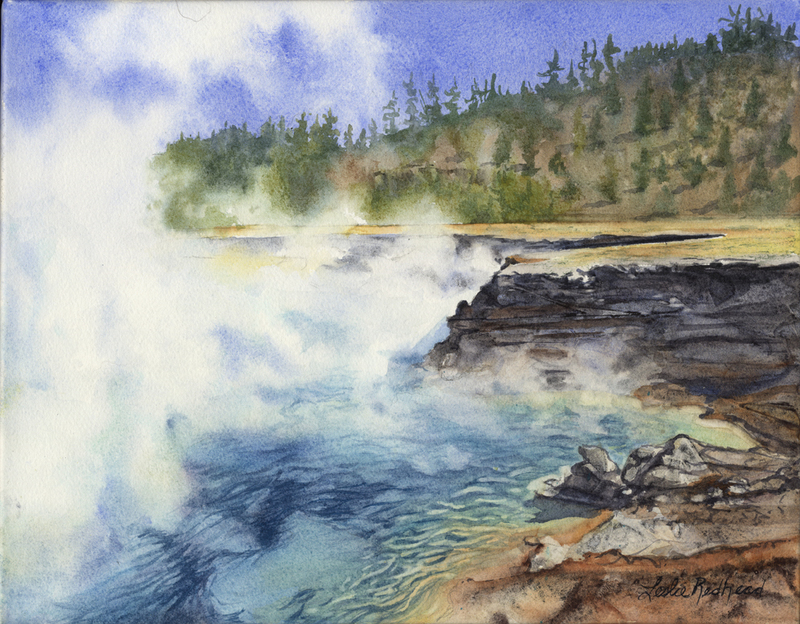 I have wanted to paint Yellowstone National Park for many years and decided that now was the time. My family has had countless holidays to the park and I feel like through all the moving around, it has been a constant in my life. 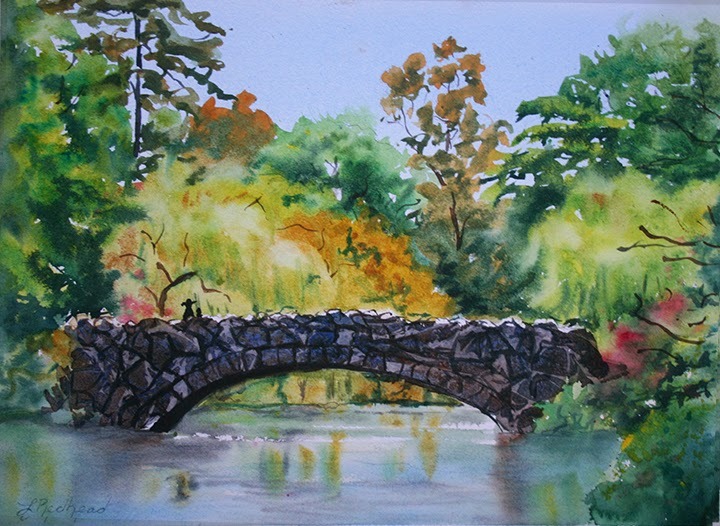 This past year, I have worked on painting memories of the park and discovering what about this region inspires me . 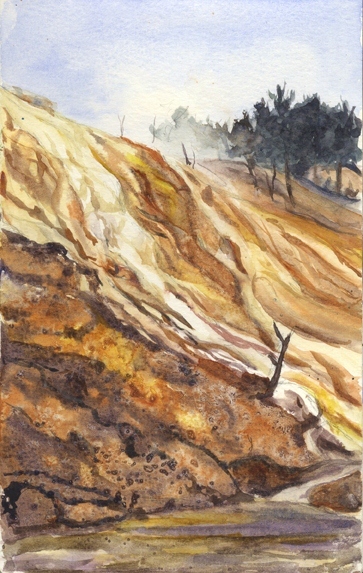 This study of Mammoth Hot Springs is one such memory. It is from a time where my parents took me and my children (who were small at the time) to visit the springs. Although it was a cloudy, overcast day, it was wonderful to be there and I was extremely camera happy. Along with the melting ice cream cones and the lounging elk, we saw a small original Thomas Moran watercolor almost hidden away inside the museum. 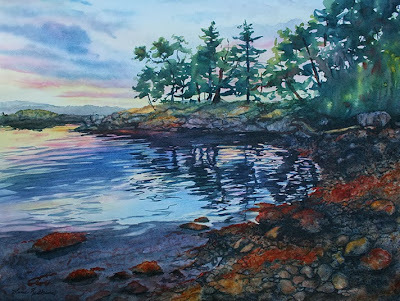 For those of you that were not able to attend my workshop last month at April Point Spa and Resort, you missed a fabulous few days in painting paradise. 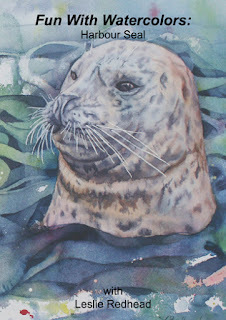 But do not despair, I made a DVD of how to paint that adorable harbor seal. The DVD is $30 USD (plus $5.99 for shipping and handling ) for orders placed in the US and Canada. For other international orders, please contact me for shipping prices.